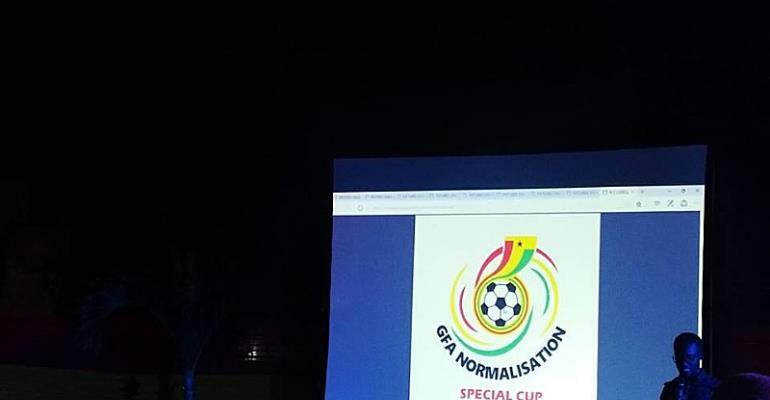 The logo for the Normalization Committee's special competition has been finally been unveiled. The official launch of the competition took place at the premises of the Ghana Football Association on Monday evening. The competition will involve the 16 Premier League clubs and the 48 Division One side. The Ghana FA logo is embedded in the new logo to illustrate a revolution in the country's football governing body. The competition is set to be an official resumption of domestic football activities for the Premier League and Division One football clubs in the country after football activities in the country was brought to a halt since last year June after airing of the 'Number 12' video by Anas Aremeyaw Anas. The logo comprises of red which means Protection and Guidance, yellow which means Loyalty and Success, green which means Renewal and Growth and white which means Purity and Peace. The date for the commencement of the competition is yet to be communicated to the public.